LANCASTER – Members of the Air Force Sergeants Association Chapter 1328 hosted a barbecue lunch last week at the Lancaster Veterans Home in honor of the 66th U.S. Air Force birthday. AFSA provided burgers, hotdogs and a birthday cake. 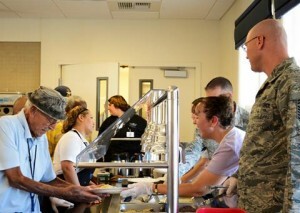 Members of the Air Force Sergeants Association served a barbecue lunch. Lawrence Hawkins, supervising rehabilitation therapist at the home, said that AFSA has been sponsoring a number of events for the veterans, like the annual Super Bowl party and a trip to a Los Angeles Dodgers game. The residents are also invited to shop at the Exchange once a month. Tech. Sgt. Brody Anderson (left), 412th command chief executive assistant, visits with residents during the 66th Air Force birthday barbecue celebration. 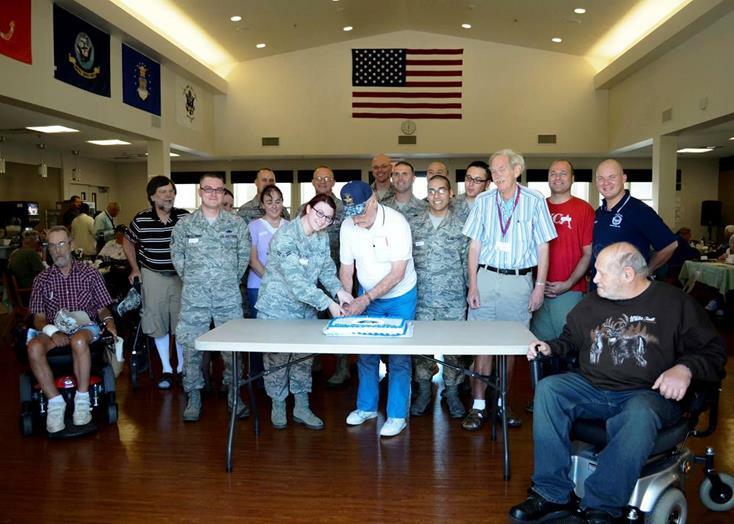 AFSA has hosted an Air Force birthday celebration for the home since their opening four years ago. In previous years, the celebration was just a cake and flag ceremony. 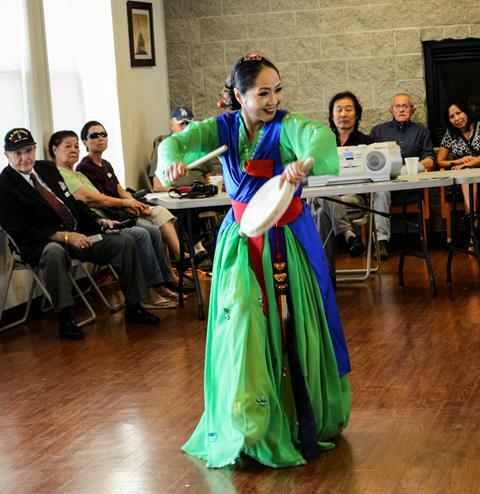 This year was the biggest one yet with cake, the barbecue and traditional Korean dancers. Staff Sgt. Adam Shura, AFTC command chief executive, said that volunteering with veterans taught him respect. Following the barbecue lunch, there was a special performance by a traditional Korean dance group. Shura grew up in a family with a long history of service. Learning from his grandfathers and seeing where they served gave him a greater sense of “drive and pride.” He has volunteered at the home on numerous occasions including decorating doors for Christmas. He brings his daughter along and she is excited to spend time with and talk to the residents. 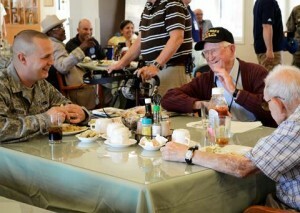 He commented that listening to their stories is his favorite part of their visits. “I think it’s important because we’re losing that era and my children will never have the opportunity to meet the Greatest Generation. So to be able to bring them down here and give them that opportunity is something that they’ll never get another chance to do again,” said Shura. “It’s very important that [the enlisted men and women] care,” said Dimonaco while he waited for the barbecue to begin. After lunch, Naval Air Corps veteran, Earl “Andy” Andrews, 92-years-old, cut the birthday cake surrounded by the AFSA volunteers. Burd, who is the local AFSA vice president, said visiting the home feels like visiting “family.” He added that AFSA hosts various fundraisers throughout the year to fund events like this. One fundraiser in particular is a Wounded Warrior 5K, the proceeds help sponsor base events too, like A Day at the Park.